Anthony Lavon Wright (born February 14, 1976) is a former American football quarterback, who played in the National Football League for the Dallas Cowboys, Baltimore Ravens, Cincinnati Bengals and New York Giants. He played college football at South Carolina. Wright attended West Craven High School, before moving on to the University of South Carolina. He became three-year starter for the Gamecocks, leading them to a record of 12-21 over the three years, including a 1-10 campaign in his senior season. 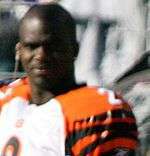 Wright made the Pittsburgh Steelers roster in 1999 as an undrafted free agent, where he was the team's fourth-string quarterback (behind Kordell Stewart, Mike Tomczak, and Pete Gonzalez). He was waived on August 27, 2000, in favor of rookie Tee Martin. On August 30, 2000, Wright was signed by the Dallas Cowboys to their practice squad. Even though he hadn't play in an NFL regular season game, he was scouted in a preseason game between the Cowboys and the Steelers. In November, he was promoted to the active roster after backup quarterback Randall Cunningham was injured. On December 10, when Troy Aikman suffered a concussion playing against the Washington Redskins, Wright played the remaining three quarters in a 32–13 win. Although he had only attempted 5 passes (3 completions) in the previous game, he was given the start in the next game against the New York Giants, which resulted in a 17–13 loss. He would also start the final game of the season against the Tennessee Titans, which resulted in a 31-0 loss after he had three critical turnovers in the third quarter. Head coach Dave Campo released Wright from the team on September 1, 2002, following the acquisition of quarterback Chad Hutchinson during the offseason, while stating that Stoerner was better suited for third string quarterback role, in light of Wright's ambition to be a starter. On April 13, 2007, he signed as a free agent with the New York Giants, throwing him into a four-quarterback scramble for roster spots with Eli Manning, Tim Hasselbeck, and Jared Lorenzen. He was named the third string quarterback in a season that saw the team win Super Bowl XLII, beating the previously undefeated New England Patriots.